I got a lot done on my game today, and I feel that it's mature enough that I can make a post about it. 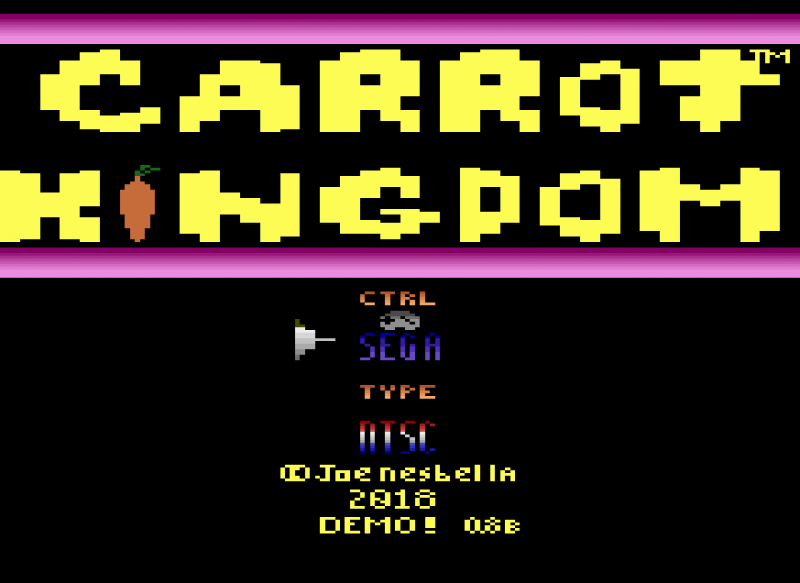 After making a few VCS demos and such but not feeling like finishing them, I thought I'd come up with a game for the VCS I'd get passionate about. After Sprybug's awesome Sidescrolling games, I figured I'd try and make one myself, because sidescrollers are always awesome. Mine's not quite as complex as it only scrolls one way, but I figured I'd keep it simple for my first one. Old .8 - Update 9/23/2017 Re-coded collision, added 2 levels and under the hood changes. OLD .07h - Update 2/19/2017 Fixes weird bug with input capacitor (MUCH THANKS DIRTY HAIRY!) fixes FBP compatibility. OLD - .07g - Update 2/14/2017 (Later Evening) Adjustment to keep from Breadcat Battle 2x. OLD - Update - 2/14/2017 (Evening) Adds ability to move and shoot and shortens pre-Bread Cat jump. OLD - Update - 2/14/2017 - A lot of polishes, fixes, coloured levels, multi-enemies, etc. OLD - Update 7/28/2016 - Fixes flamethrower sound buzzing on lives screen. OLD - 7/28/2016 - Reduces Scanline usage to 262, tweak UI, Flamethrower Bugfix. OLD - Update 7/15/2016 - Fixes Jittering. OLD - Update 6/7/2016 - Updated Physics Demo. Lush Multicolour landscapes full of danger! Edited by Jinroh, Wed Sep 12, 2018 9:48 PM. A lot of cool stuff going on here. Going old school and writing your own kernal! Pretty sweet. ..
Really Cool. Can't wait to see what lies beyond the door. Thanks guys! The boss battle that lies beyond the door is almost done. After that's done I wanna put out a demo. Then throw bankswitching in and start loading up on more levels. This looks really cool! Keep up the good work. Thanks for the motivation guys, I'm trying to get a demo ready as soon as I can, so I can get some feedback. Just need to tweak a few things first, and finish the first boss. Runs great on the Harmony, but not on the Supercharger yet. It'd make a cool Multi-Load game. Runs but some things must be butting up against the RAM because it's a bit wonky when it scrolls. Edited by Jinroh, Mon Oct 12, 2015 11:21 AM. LOVE IT! I love games with girl hero's that battle hybrid root food!! Great work! Haha, glad I hit all the high points then. :3 She's actually a cat-girl too. She has cat ears on her head, but dunno if you can immediately tell from the sprite. Cool game and scrolling engine! Make sure FFF8 isn't touched, sounds like the SuperCharger's write protect switch is getting turned off. Thanks Mr. SQL glad you like it! Right. I could have sworn I was avoiding FFF8, before I loaded it up on my SuperCharger, but perhaps some branch or something is hitting it inadvertently. I'll have to double check. Edited by Jinroh, Tue Oct 20, 2015 1:46 PM. New Teaser video! 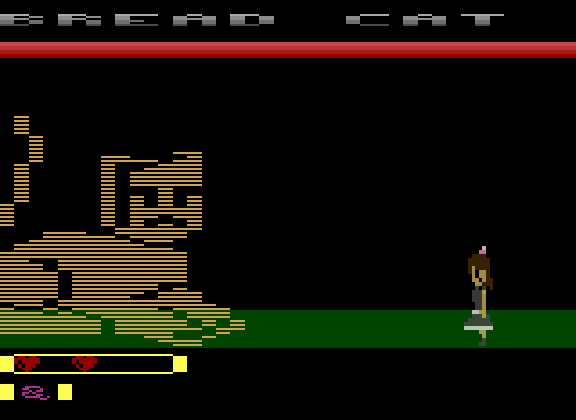 Check out Boss #1 The Bread Cat! Can Jinny best this foe!? I'm also working on getting the playable demo put together so I can get feedback, but always something to do, but slowly but surely it's coming about. Edited by Jinroh, Fri Dec 11, 2015 5:56 AM. This is looking pretty sweet. Love the Bread cat swat. Great artistic representations on the VCS! Thanks man, I'm really happy/proud of how the Bread Cat turned out. That cat looks really neat! As does Jinny. And the tail slap is a really nice detail. And I guess in the final version the green lower half won't start in the middle of the scanline. This is really cool! Very well done I think. Thanks guys, glad you're liking it! Haha yes, that green is on my todo list. Hmm...I didn't really think the text looked too bad, but I'll add it to my polish list, and play around with it to see what I can do with it. 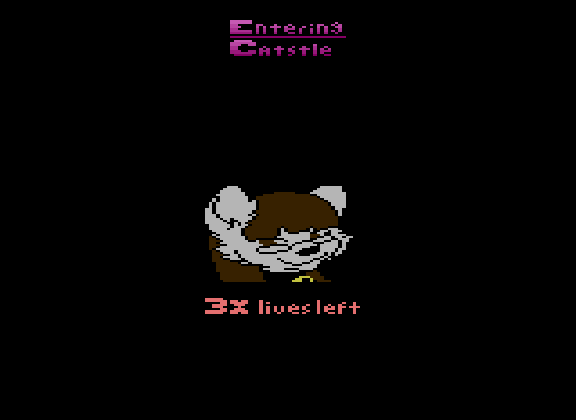 Finished the last of what I wanted to do for the Boss Engine, Jinny walks across the screen and the boss appears. Also fixed the mid-scanline change on the green background. First try at the Title Screen (that's about all I have left besides writing the music engine for the first demo) any suggestions or anything? I really like the lettering personally. :3 I'm up for whatever tricks you may have that I've not thought of. EDIT: After some more playing around, I'm going to keep the text and ditch the background. I have a cuter, simpler thing in mind. Edited by Jinroh, Thu Dec 17, 2015 8:59 AM. I think that would look good. I like the text! Thanks man, yeah I think the bubble letters converted to PF Graphics pretty well. Haven't gonna get rid of the background and make a cutesy-er arcadey-er graphics to go with it. EDIT: After some thinking and playing around, here is a screenshot from Stella of my current idea which, I rather like. Maybe cutesy for some, but I like it. Edited by Jinroh, Tue Dec 29, 2015 2:00 PM. I like it. Colorful and oldskool arcade like! Thanks man, I was trying to channel early 80s arcade feel when I re-booted the title screen. I really like it, also kinda looks like a Christmas sweater design.